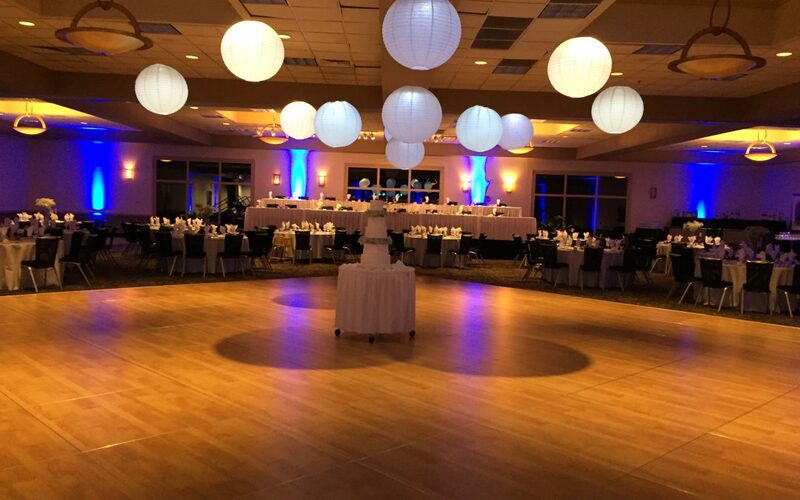 The Tinley Park Convention Center wedding event was a night to remember. Felix and Fingers drove out to Tinley Park which is in the heart of the Midwest, and just 30 miles south of downtown Chicago. 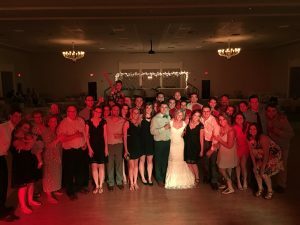 The bride and groom transformed the Tinley Park Convention Center ballroom into a sweet and romantic venue for their special day. Congratulations Joel and Sara! 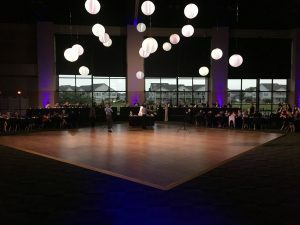 The Tinley Park Convention Center wedding event was absolutely breathtaking! To begin with, professional staff set up and decorated the ballroom to ensure that this couple’s dream became a reality. 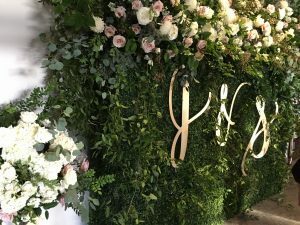 From the stunning flower arrangements to the amazing decor there wasn’t a single detail missing. In addition to the amazing ceiling work to the spacious dance floor, the event planners outdid themselves. Joel and Sarah’s guests filled the room with laughter and love to celebrate the couple’s special day. 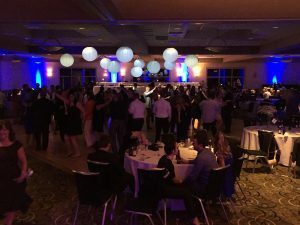 If you are interested in holding your next special event at the Tinley Park Convention Center please click here. 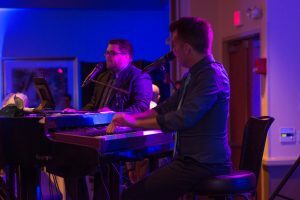 Our performers for the Tinley Park Convention Center wedding event were Duncan Parker and Robert Deason. To be honest, this is one dynamic duo. These two guys really know how to put on a show! To start with, Robert and Duncan played a variety of background jazz while guests enjoyed drinks and hors d’oeuvres. It wasn’t long before guests were dancing to songs such as Naima by John Coltrane and Good Life by OneRepublic. Everyone agreed the butler passed bacon wrapped scallops were a hit with the crowd! The Tinley Park Convention Center wedding event went above and beyond expectations. For example, the service was amazing! Attentive and friendly staff were available to check on our performers and guests during the reception taking care of any requests. Dinner was spectacular. Guests raved about the amazing service at the bar and buffet. During dinner, our performers played songs such as Cross that Line by Joshua Radin and Arms of A Woman by Amos Lee. A special and non-traditional surprise for dessert was the wedding cake, it was ice cream! Following dinner and speeches, dancing was in full swing. Robert and Duncan have played a fair share of receptions and the Tinley Park Convention Center wedding event had a lot going on! Not only did they set the tone with Signed, Sealed, Delivered, I’m Yours by Stevie Wonder but they slayed it with an energetic Holiday by Madonna. What is more, Felix and Fingers LOVE to play the kind of party where everyone ends up barefoot, sweaty and with laryngitis from singing along loudly. In other words, the crowd went wild and crazy with Bohemian Rhapsody by Queen. It was great watching EVERYONE have a blast! 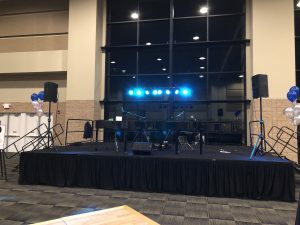 In conclusion, Felix and Fingers had a fabulous time playing at the Tinley Park Convention Center wedding event. Our performers heard tons of compliments during the night from our happy client. If you would like us to play at your next event send an email to info@felixandfingers.com or click here for more information. We look forward to hearing from you soon!